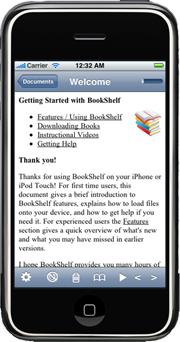 Tomes (formerly BookShelf) is an easy to use electronic book reader for the iPhone, iPad, and iPod Touch. Available through the AppStore, Tomes installs easily on your mobile device. It's easy to read your books on the go! Tomes lets you read any text or HTML file, older Palm OS reader files, and ePub books. Many file types can be downloaded from websites directly to your iPhone. You can even download any web page and read it later without needing an Internet connection. New in 2.3: Drop ePub, Palm, text, or HTML files in your DropBox.com account; and you can download them any place you have an Internet connection, no ShelfServer required. For books on your Mac or PC computer, you can use the free ShelfServer application to automatically convert and transfer files via WiFi. ShelfServer allows Tomes to support many more formats by instantly converting files on-the-fly as you download. Please see Tomes Supported Formats for a complete list of supported file types. Note that not all Tomes supported types can be downloaded via DropBox. Tomes lets you read your way! You can customize Tomes to read the way you want. Change fonts, size, and colors; set a background image or texture; landscape or portrait; manual or auto-scroll. Several easy-on-the-eyes color themes are included in Tomes, and you can easily create your own color themes. Foreground, background, and link colors are customizeable. You can even pick an image from your iPhone's camera or from your photo library to use as a background. If you find a background texture you like on the web, save it to your image library in Safari (tap & hold the image), and you can use it in Tomes. Tomes can rotate to any of the four directions. Once you have the screen the way you like, tap the "rotate lock" icon on the bottom toolbar, and Tomes will stay that way no matter how you turn your iPhone. Rotate lock makes reading in bed or lounging comfortable! No more craning your neck or twisting your arms just so to keep your screen from rotating. Note that on an iPad, Tomes uses iPad's hardware orientation lock switch instead. Tap-to-scroll, drag your finger, or let Tomes do the scrolling for you. When you tap the top or bottom 1/3 of the screen, Tomes automatically advances one full page back or forward. When you get to the end of a section, a yellow "highlighter" shows you where the bottom of the screen was before you scrolled so you don't have to scan to find your place. Tap zones are configurable so you can tap the left or right side instead or tap the top of the screen to go foward if you prefer. You can also drag your finger to scroll or center the text however you like. If you'd rather read hands free, Tomes supports auto-scroll which slowly and smoothly advances the text like rolling credits from a movie. You can configure the scrolling speed to your liking for leisurely or speed reading. If you're still deciding if Tomes is right for you, read on for features and supported file formats. You might also want to take a look at the Demonstration Videos for a quick tour of the application. For more screenshots and a walk through of the application, check out Using Tomes. Add named bookmarks to any document type. Access the Table of Contents in formats which support one (Plucker, Mobi, ePub). Support for large files -- no upper limit on size, and files as large as 10MB open in seconds. Completely off-line usage. Once downloaded to the device, books can be read without an Internet connection, even in airplane mode. Tomes currently supports many book formats with more on the way. For full information on formats, please see Tomes Supported Formats. Please note that at this time, Tomes does not support PDB files which were created for the iSilo or eReader programs. Support for these formats is planned for a future release.